I feel a shake in my Spirit when I call your Name. When you think of the name of Jesus Christ, what comes to your mind? What do you associate with the name of Jesus Christ? Recently, I undertook a task with someone and when we arrived at our destination, both the individual and I were terrified by what we saw. However, the first thing that I did was to call on the name of Jesus Christ repeatedly as I had a strong belief that the name of Jesus Christ would protect us and also lessen our fears. Guess what readers? The Lord took control of everything and our fears were gone and everything was alright. 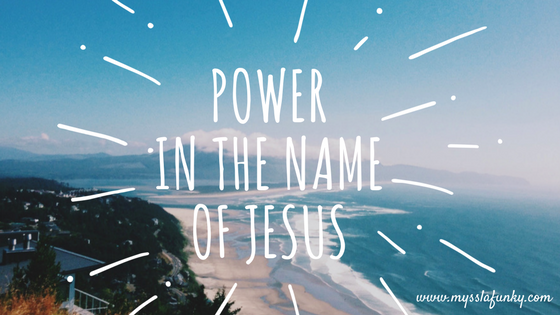 A confirmation that there is power in the name of Jesus Christ. Last weekend, we had Todd Dulaney's song ("Your Great Name") on repeat at home. I also watched a review of Tasha Cobb Leonard's new gospel music album on YouTube, click here to watch the review. This two experiences coupled with my initial experience on calling the name of Jesus Christ triggered this post. - The name that is associated with a sinless life. - The name that gives joy. What do you associate with the name of Jesus Christ? Do you have any experience with the name of Jesus Christ that you would like to share? Enjoy this song by Todd Dulaney. Thank you Sage. No wonder Jesus Christ said that He is the Prince of Peace. Halleluyah, no matter whatever the situation or circumstance is, at the name of Jesus I have no doubt that everything will be and is alright. Thank you Odazzle. This means, mentioning the name of Jesus gives us reassurance that He is with us always; thus all will be well with us.